General Motors and LG Group will jointly design and engineer future electric vehicles, expanding a relationship built on LG’s work as the battery cell supplier for the Chevrolet Volt and Opel Ampera extended-range EVs. The definitive agreement signed Wednesday will help GM expand the number and types of electric vehicles it makes and sells by using LG’s proven expertise in batteries and other systems. For LG, the arrangement represents a widening of its portfolio as an automotive solution provider. 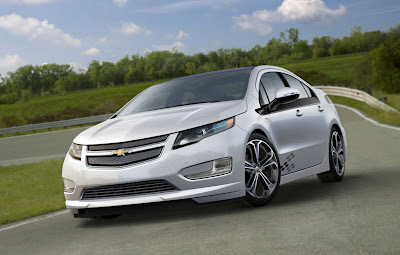 The success of the extended-range propulsion system in the Volt and Ampera led to exploring other collaborations in the electrification of the automobile. Teams of LG and GM engineers will work on key components, as well as vehicle structures and architectures. Vehicles resulting from the partnership will be sold in many countries. “This is a strategic development for LG and we fully support GM’s goal to lead the industry in the electrification of the automobile,” said Juno Cho, president and chief operating officer of LG Corp. Accelerating the pace of roadworthy technology is more important than ever with the announcement of a number of more stringent emission and fuel consumption regulations around the world, including the recent agreement calling for a U.S. Corporate Average Fuel Economy (CAFE) of 54.5 mpg (23.2km/l) by the end of the 2025 model year. Electric vehicles, which have no tailpipe emissions and require no gasoline, are expected to play a major role in reaching the CAFE goal. Timing of the launch of the first vehicles resulting from the partnership will be announced closer to market readiness. The agreement does not involve an exchange of equity between the companies. GM and LG have been running a Chevy Cruz EV demo fleet in Korea for at least the last year!